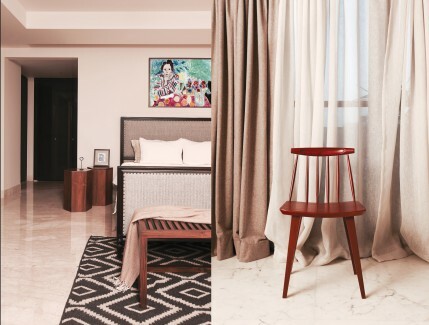 Mumbai-based Flamingo Interiors has a rare talent – the ability to juggle multiple templates of inspirations from different eras to create well-rounded modern spaces. Partners Aashni Pandya and Esha Pandya Choksi were inspired by the one-legged elegance and balanced beauty of the flamingo while naming their firm. 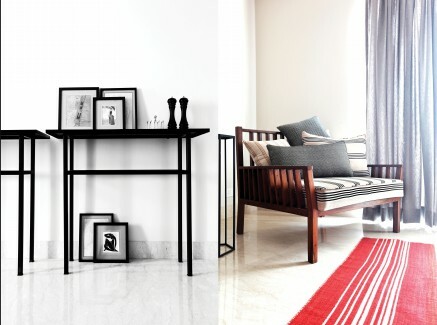 The duo has a penchant for bold patterns and leads a team that works in the fields of interior design, architecture, and customised furniture design. The creative insights informing the firm’s designs are never limited to one geography or even one timeline, and their projects often boast a talent for bringing together eclectic props and materials and making them work as a glorious whole. The following three are no exceptions. This is a soft-shell pink paradise. 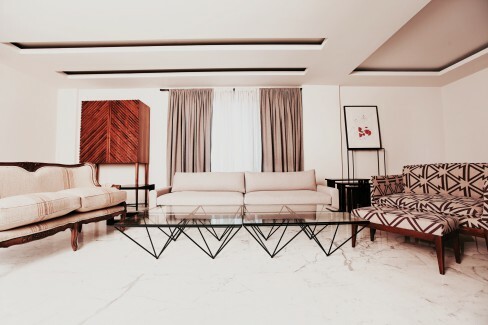 The resident of the home is a globe-trotting fashion designer who comes back to this Mumbai pad to sort of unwind, away from the rigours of work. So, naturally, the rooms had to promise an appropriately calming ambience that still kept the embers of creativity alive. 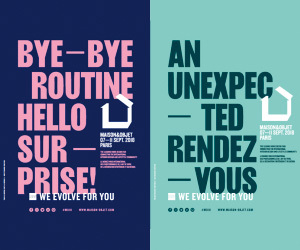 “Keeping in step with the client’s requirement to stay connected to the western world, our design, pivoted around strong influences from vintage Europe, endeavours to transport the end user across space and time,” states the team. The visual vibe of the house is indeed charmingly old world, with minimalist modernity informing its layout scheme, the latter necessitated by the need to balance style and limited space availability at Cuffe Parade. 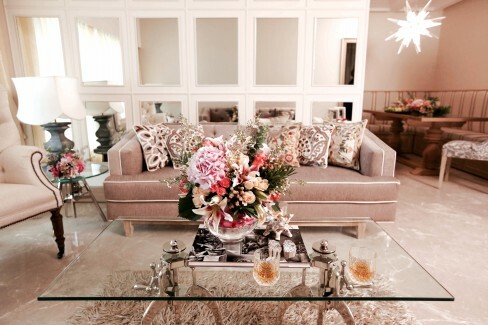 The design team smartly applies a free-flowing arrangement here with patterns that keep repeating and a colour scheme that is tone-on-tone and features a preponderance of pink tints. 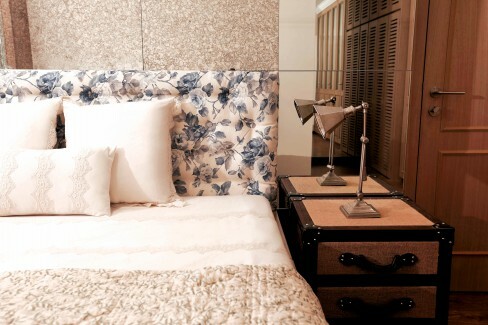 The floral patterns on much of the upholstery, the wide button-tufted headboard in the bedroom, the mirror-and-wood cabinetry, and the chandelier pieces establish a calm, confident sense of elegance. The overall look showcases a strong affinity to hotel suite design – the rooms stick together, allow easy access, and establish thematic harmony. “It creates an oasis for our client in the middle of the gridlocked city of Mumbai,” adds the team. This apartment exists in a universe far removed from the one mentioned above. 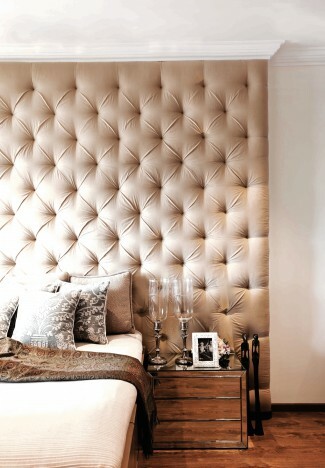 The style statement here is unmistakably modern and clean cut, it’s thinking more geometric than flowery. The design team relies on impeccable shelving to make a statement at this home. From wide, open, uneven assemblage to a tight grid of even squares, the shelves add a surprising amount of style to the interiors. Furniture legs are the other eye-catching elements. The tables have plain tops but their legs are allowed to be happily eccentric. The living room glass table, for example, is wide and is held up by an array of small legs shaped like inverted pyramids. Another side table, primed to hold show pieces, has slender crosses complicating its look. There is virtually no drama on the walls; the excitement is brought on by the patterned cushions, cabinet doors, rugs and the Statuario marble flooring, the latter giving way to teak wooden flooring in some sections. “The diverse furniture and accessory pieces have been curated from across India, as well as from Abu Dhabi, Singapore, Florence and Hong Kong,” informs the team. This selection method ensures an eclectic spread, including side-tables shaped like faceted cuboids, formed of stacked trunks, and made to look like a smooth disk standing on thin metal chopstick legs. These inspirations travelled back and forth in time, scooping up some classical French bits and some mid-century modern looks, and mixed them up. No wonder it all looks so enticing and that too under one roof. 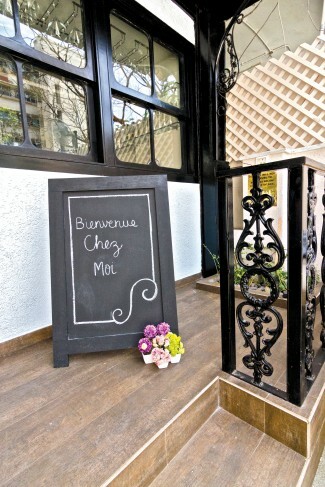 Chez Moi is French for ‘home’. No surprise then that the designers tried to establish something homely and shorn of pretence here. 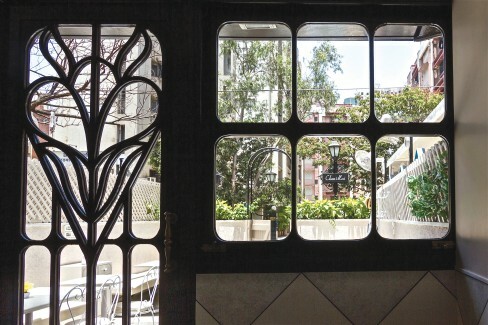 This Oshiwara branch of the bar and bistro brand attempts to set up an intimate corner of French wistfulness in the midst of Mumbai’s patented chaos. Within this French context, the visual template of choice is rustic/country, so the lighting is subdued and the colour scheme pastel. Everything about this space is two decibels lower than normal; this is a place for afternoon confidences and easy laughter. 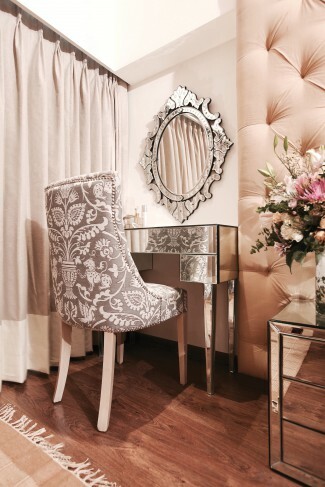 The sparkling cutlery, the flowers, the elegant curvature of the floral design on the door and on the mirror frame and chair backs, are all part of the design scheme. 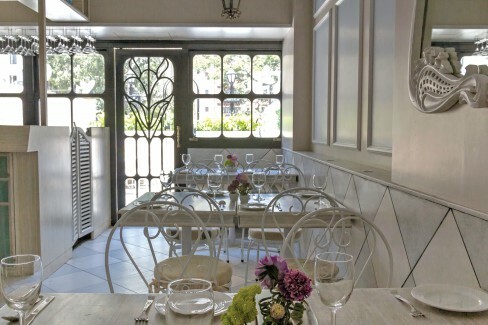 The small tables, the mesh enclosure with greenery peeping in from its gaps, the wide diamond patterned tiles, and the wrought iron detailing, would check all the boxes on a European vacation design mood board.